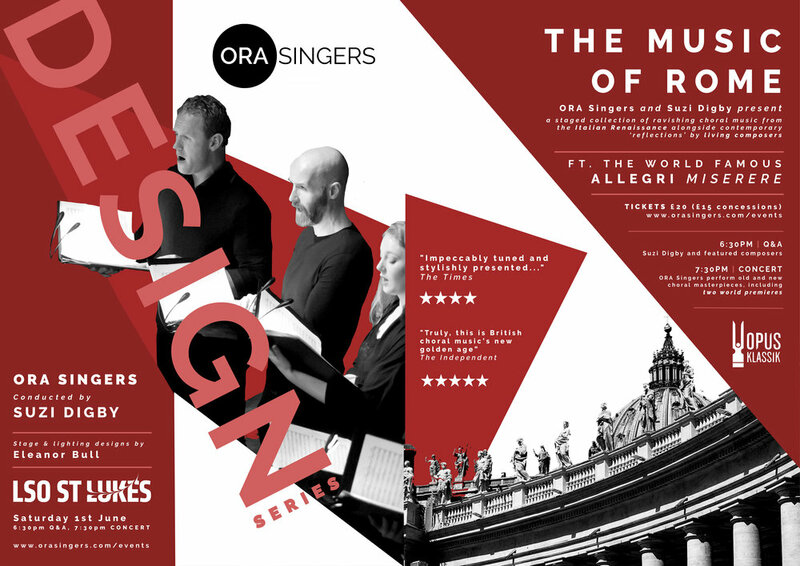 The second concert in ORA Singers' new DESIGN SERIES, where a different designer is asked to collaborate on each of nine concerts at LSO St. Luke's, creating a unique design around the musical programme and the fantastic space of LSO St. Luke's Jerwood Hall. The second concert in ORA Singers' new Design Series, where a different designer is asked to create a unique design around the musical programme and the fantastic space of the Jerwood Hall. In addition, and included with your ticket, drop in at 6:30pm for a short Q&A with Suzi Digby and Composers. ORA Singers presents a programme inspired by Rome's rich catalogue of Renaissance composers who worked at the Sistine Chapel, from Palestrina to Ingegenri, Marenzio to Porta. The programme is book-ended by two choral classics, the iconic Allegri Miserere, and the modern masterpiece that is MacMillan's setting of the same text. As with all ORA programmes, Renaissance works sit side-by-side with stunning modern reflections and text settings, including the world premiere of two reflections on Palestrina; Edmund Finnis' Improperium expectavit cor meum, and Janet Wheeler's Terra Tremuit. Tickets not yet available, please check back soon.